Historian Dr. Merl Elwyn Reed was a key founder of the Southern Labor Archives at the University Library. A native of Syracuse, New York, he served on the faculty of Georgia State University from 1965 until his 1994 retirement. In 1968, Reed learned of the newly-formed Texas Labor Archives at the University of Texas at Arlington from Dr. George Green. That conversation at the Southern Historical Society meeting led to the creation of the Southern Labor Archives at GSU. At the time, Atlanta labor leaders were looking for a way to honor Joseph Jacobs, a labor lawyer, for his many contributions to the local movement. Approached by Reed about working together to form a labor archives at GSU, the fraternal order of the Organized Labor and Workmen’s Circle planned an event that would celebrate Jacobs and generate proceeds dedicated to the new archives. On campus, Reed worked with GSU President Noah Langdale and University Librarian William Russell Pullen. With their support, a group of GSU faculty and administrators entered into an agreement with the members of the Organized Labor and Workmen’s Circle Labor Awards Committee to found the Southern Labor Archives. Its mission, then as now, was to document the history of work and workers in the South. Officially formed on April 28, 1970, the Southern Labor Archives began preserving labor history in July 1971 after the hiring of its first archivist, Dr. David B. Gracy, II. Regarding the loss of historical records prior to the founding of the archives, Reed stated in a Signal article from 1972 that “[i]t is a crime that this happened because the labor history of the South has not yet been written…[a]s the labor archives develops, I believe people doing research on organized labor will come here from all over the United States.” Today, the Southern Labor Archives has over 500 collections used by researchers from throughout the Southeast, the United States, and the world. 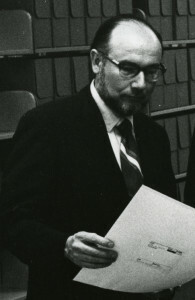 Reed’s colleague Dr. Gary Fink, also a distinguished labor historian, was instrumental in the early development and promotion of the Southern Labor Archives. In 2000 Fink led the creation of the Merl E. Reed Fellowship in Southern Labor History, honoring Reed’s career and role in the founding of the Southern Labor Archives. After Fink passed away in 2008, Reed requested that the fellowship’s name be changed to honor Fink as well. The Reed Fink Award in Southern Labor History now honors both men and their many contributions to education, labor studies, and the Southern Labor Archives. Fortunately, Dr. Reed was able to attend one last Reed Fink recipient talk earlier in the year. With 1971 as a starting point for its operations, the Southern Labor Archives celebrates its 45th anniversary this year. Founding the labor archives resulted in the establishment of Special Collections and Archives within the library, which has grown to include the University Archives, the Popular Music and Culture collection, the Women and Gender collections, and several important photographic collections. Dr. Reed’s commitment to research and education will live on through the work of the Southern Labor Archives.